The launch of the Nelson Mandela International Day Campaign 2014 at the Nelson Mandela Centre of Memory today, 8 April 2014, signifies the commencement of the Foundations’ global call to action for public service. From today, change makers and legacy advocates across the globe will initiate and host activities within their communities in commemoration of Mr. Mandela’s lifetime commitment to freedom and service to one’s fellow man. And while each year sees an increase in participation in Mandela Day activities across the planet, the poignant message of this year’s launch event was clear: Make EVERY day a Mandela Day. Nelson Mandela Foundation CEO Sello Hatang highlighted the significance of Mandela Day as an event that honors South Africa’s late statesman and provides an opportunity for all to emulate his role as public servant. “Mandela Day is not only about doing good, it is about service. It is an opportunity to build upon Mr. Mandela’s lifelong belief that we must live to serve every day, in whatever we do,” he said. This year’s Mandela Day launch is particularly symbolic in that it offers South Africans, and the world, an occasion to honor the ethos of the late Mr. Mandela in the year that marks South Africa’s 20th year of democracy. One man’s vision and journey provided the world’s change makers with an opportunity to positively impact their communities, spirited by the belief that we live to serve every day. Indeed, Mr. Mandela’s willingness to give up everything for freedom, equality, democracy and justice itself embodies the values of the United Nations, those of peace, freedom and human rights, and inspired the formal adoption of the Mandela Day campaign by the UN General Assembly in 2009. “We celebrate his life as we endeavour to make peace a way of life around the world,” said Dr Agostino Zacarias, the United Nation’s Resident Co-ordinator. Fundamentally, Mandela Day creates an opportunity for the ‘haves’ and ‘have nots’ to work together to confront social ills within their communities and build a better world. It evokes a broader ethos of service that opens Madiba’s legacy to interpretation, where people across the world can apply the theme of service in their own context. “Nelson Mandela fought for social justice for 67 years of his life. It is not too much to ask that we devote 67 minutes of EACH day in EACH year to honor his lifelong legacy. This is a day that inspires all of humanity and reminds us of our public service to each other,” said South Africa’s Deputy President Kgalema Motlanthe. Speaking about the day as more that superficial ‘do-gooding’, the Deputy President described the Mandela Day ethos as building cultures of service that inspire positive change in communities. The most vulnerable community members in any country are those who are hungry, those without adequate housing, and those who cannot read or write. Indeed, being deprived of life’s basic necessities it to be deprived of one’s dignity and one’s humanity. 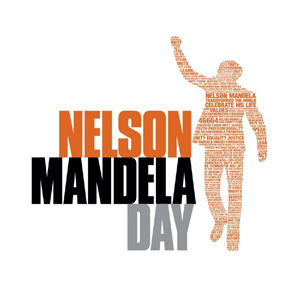 The Nelson Mandela Foundation this year has identified key themes for Mandela Day activations around the world, namely: education and literacy, shelter and food security, and participation through volunteerism. Nelson Mandela left the world’s citizens a simple instruction: “It is in your hands now”. Today we challenge all members of the global community to participate in “making every day a Mandela Day”. As we remember the late iconic public servant, Nelson Mandela, the message is clear – each individual has the ability and responsibility to impact positive change every day. Let’s spread the message of hope and action together. In recognizing the work of some of the Mandela Day advocates and change makers who have joined the Foundation’s call to action, it is necessary to share how we need to grow the momentum and support for Mandela Day through the restoration of human dignity and the connection of individuals and communities. So how can you serve? Education and literacy- South Africa’s democratic vision is about making it possible to give our youth a fighting chance. To give every person an opportunity. Leadership through Literacy – The Mandela Day Libraries and Literacy for Leadership Initiatives speaks to the above and covers the provision of traditional and technological literacy programs with skills development. Here I would like to acknowledge the continued work and contribution of organizations like Breadline, SAA, ACSA, PPC, KayaFM, GIA, AIG, RMB, ABSA, Nedbank but to name a few. Food security- The Nelson Mandela Foundation in collaboration with partners such as Tigerbrands, Vodacom, DBE, Stop Hunger Now, Pick ‘n Pay – has identified the distribution of food parcels as one of its core initiatives. Food insecurity is not just a global concern but is affecting South Africa too. Through this initiative, the Foundation would like to challenge corporate South Africa and the donor community at large to distribute 670,000 food parcels between 2014 and 2016. Shelter- The shelter security initiative brings people together to build homes, communities and a future. A home is instrumental in breaking the cycle if indignity from one generation to the next. The project is achieved through volunteers and the donor community facilitated by various partners including Habitat for Humanity. Let’s join Habitat and others in building our communities. Trading Live– This is a special project introduction today which is about connecting people through service- this concept, pioneered by Rhodes University, is premised the basic idea that individuals give of their time to build new relationships of reciprocity in their communities. By making offers and requests to trade their skills, talents, interests or hobbies with other interested parties, participants form wide ranging networks of connections based on community solidarity. The aim is to ignite new connections with existing Mandela Day partners like City of Tshwane, City of Johannesburg, City of Cape Town, DHET, UNISA, Wits, UJ, UCT and their sister organizations and affiliates that can build long term relationships founded on reciprocity, mutuality and respect. The Foundation would like to extend the project with Rhodes University to key metropoles locally and internationally working with identified academic institutions and local government bodies to create platforms and practical opportunities for such connections. Participation and Volunteerism- The global call to action for public service is covered by a number of existing and potential initiatives that covers the activities by the public in terms of giving of your time/self for the common good- leg of the Mandela Day Campaign or general contributions and special Mandela Day events. This includes, amongst others: Bikers for Mandela Day Project, the KAYA FM 67km Relay for Mandela Day, Cycalive and TrekforMandelaDay. A Proud Stakeholder of the Mandela Day Campaign.